In Sweden when creating a company you need to send an application to the Companies Registration Office. In that application you need to list, in order of preference, the names you are willing to accept for your company. Beantin webbkommunikation was one of the names towards the top of that list. Why Beantin though? Well. At the University of York in the early 90’s I studied Economics. One of the lecturers there was David Gowland. A clever, slightly eccentric, entertaining lecturer. Being 18, creative and foot-loose at university, David became the inspiration for a single-frame stick-man cartoon I started to draw. Gowland was the main character, but even from the first first cartoon, Gowland’s girlfriend made an appearance. 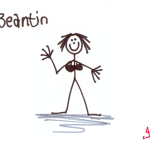 Beantin is her name. She is the one with the brains. Her greatest hobby is confusing Gowland. Which she does with remarkable ease. 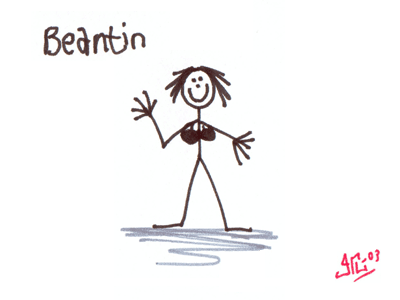 Even though The Cow is my favourite character, I have a particular fondness for Beantin and her intelligence. Beantin works well from a web-age branding perspective. Written as a single word it is readable, searchable and recognisable. Admittedly, one thing I failed to realise was that many Swedes wouldn’t automatically recognise Beantin as English, and often pronounce it “Be-an-ten”. On the plus side, when I created Beantin webbkommunikation in 2006, there was the obvious bonus that beantin.se was still available. The Gowland website isn’t quite as well maintained as I’d like it to be. The 24-hour limit gets in the way of doing everything. But read more about the characters and take a look at some of the cartoons. Some day soon I’ll start drawing more Gowlands again, and hopefully painting a few more on canvas.